Causes of Leaks in Garbage Disposal | Heidler, Inc.
People may assume that fixing a leaking garbage disposal is very easy, but there are still factors that make the process somehow complicated. One of the reasons is that the leak can occur anywhere in the system and, therefore, it is quite a puzzle to find out where exactly the garbage disposal is leaking. Think about all the multiple outlets, inlets, rings, seals, and connections that could spring a leakage. Keep in mind that before we even get to the causes, it is important first to understand how to find the actual location of the leak and where to look for possible leaks. When water is leaking from your disposal system, it can be as simple as a broken seal or as complex as a bad disposal unit. To find the actual location of the leak, it is important first to ensure the water travels to the lowest point before dripping. Even though the water may appear to be dripping from the bottom of the garbage disposal, it is possible that it is not the actual source of the leak. For safety reasons, unplug the disposal. Place a wide bucket under the sink to catch the water coming out of the sink. Color the water you will use to test the leaking location and then plug the sink. Fill the sink with about a third of the colored water. Before unplugging the drain, ensure you examine the area under the sink to find out if there are any leaks. If so, check if the leak is caused by the seal between the sink and the garbage disposal. If there is no leakage, it means that the leak is elsewhere. At this point, it is important to go under the sink and find the highest point where you can see the water. The connection between the sink and the garbage disposal. 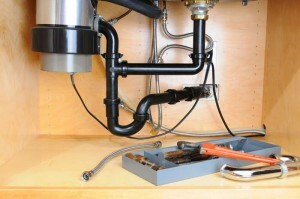 Examine the connections between the garbage disposal and the drain line. Look for leakage where the dishwasher’s drain hose connects with the garbage disposal. When this happens, the leak only occurs when the dishwasher is running. 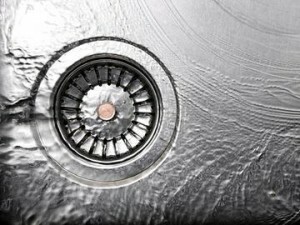 Check for leakage at the bottom of the garbage disposal. Sink Flange is the part where the garbage disposal connects with the sink drain. The first reason is the mounting bolts that are not tightened enough to hold onto the sink well and ensure there is no leakage. There are three mounting bolts in the sink flange, and they all must be tightened enough to ensure there is no leakage. The other reasons leading to a leak could be a putty that is not working as required. A putty can be replaced but to do that, the retaining bolts have to be loosened. All you need is to create a gap, and then replace the old putty with a new putty. The final step involves ensuring the bolts are well tightened to hold everything in place. The core components that connect the discharge pipe to the garbage disposal are the flange and a seal. Due to the regular use of the garbage disposal, either of them can loosen or fail to work the way they are supposed to, as an effect of wear and tear. One of the remedies is that a plumber may use the wrench to tighten the flange to ensure that the problem is solved if the discharge is due to a loosened flange. If the leak persists, the only other option left is to fix a new seal located between the retaining unit and the discharge pipe. When you go to most homes, the garbage disposal system under the kitchen sink usually has the most problems with leakage. The reason is that under the kitchen sink is where most garbage disposal system components such as seals and pipes are located. Most people utilize the area below the sink to store other household items making it more common for someone to cause damage to the discharge pipes when they are looking for something that isn’t within reach. Although extreme, this situation can happen. In fact, if someone hits the disposal hard enough, it can move a little bit and shift from its usual position thus causing leakage. A disturbance to the pipe can press the seals into an awkward position; the pipe can move creating a gap, or lead to loose bolts. Therefore, it is important to ensure that everything is in place before you check for leakage of the garbage disposal. The go-to remedies are tightening up the bolts or replacing the putty. The dishwasher drain pipe may be connected to the garbage disposal. The connection is necessary to get rid of the leftover food from the dishes. What you need to check in case of leaks is the hose pipe which connects to the dishwasher system. A loose clamp attached to a hose can also cause some leakage in the garbage disposal. To fix this problem, the two solutions available are replacing the cracked hose with a brand new one or tightening the loose clamp on the hose to ensure there is no gap. Leaks from the kitchen sink can cause many problems. For instance, all of the smells and unwanted debris from cooking may as well be materializing in the kitchen. It is also a difficult thing to figure out where to start and what needs replacing. As such, fixing a leaking garbage disposal should be a top priority and is better handled by a qualified plumber. If you are located around Annapolis, MD and looking to know more about how to fix leaks from your garbage disposal, you may contact Heidler, Inc. through (410) 268-7191.